What little girl doesn't love Barbie dolls? Now the world's favorite dolls are available in a wide variety of party supplies! Now you can transform your entire home into a Barbie paradise! 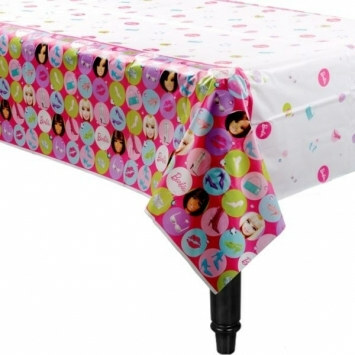 For your daughters birthday, decorate your tables with this Barbie Tablecover. This plastic, inexpensive party supply features Barbie and her friends, and their favorite accessories: shoes, purses, and sunglasses. Not only is this Barbie Tablecover super fashionable, just like Barbie, but it also protects your table from spills and messes. Guests are sure to spill food and drinks, now make sure your table stays clean!